Far too often, people and technology fail to make a meaningful connection in the collaboration environment. Even in real-time, they feel they haven’t had their needs met, even with all the connections available today. Tragically, a 2016 Forrester Consulting study cited in Prysm’s “Driving Innovation: The CIO’s Guide to Collaborative Technologies” report revealed that only 26 percent of information workers believe that their company provides the tools they need to collaborate successfully. The resulting disenchantment stifles creativity and productivity, affecting outcomes across the board. Fortunately, the next generation of collaboration and mobility technologies were built to bring more bliss to these encounters. Here are some helpful tips to bring more connection to your next meeting. As unified communication and collaboration moves from the desktop to the collaboration space, Crestron Mercury offers a bevy of presentation and communication features in a single console. Its built-in Crestron AirMedia enables users to instantly and securely present content wirelessly on the room display from a laptop, smartphone, or tablet. Precision-engineered speaker and microphones bring next-level sound quality to phone calls from mobile devices or standard SIP phone systems, as well as web conferencing and UC applications. Mercury is also IT-friendly, as it provides fast, secure cloud deployment and management, meeting the latest enterprise security standards. And it has an answer for the data-driven, too. A built-in occupancy sensor allows facility managers to collect usage data to drive efficient room utilization. Turn your BYOD device into a collaboration system with professional PTZ camera quality and full-room hands-free audio conferencing using Vaddio’s ConferenceSHOT AV Conferencing System. Geared for huddle rooms and small- to medium-sized conference rooms, Vaddio’s ConferenceSHOT AV integrates a 10X zoom PTZ camera and audio conferencing mixer into a single USB 3.0 device, so users can easily connect up to two microphones and an external speaker directly to the camera. It plays well with all major collaboration applications that us UC soft clients, and it’s UVC compliant, so no drivers have to be installed on your PC. Data bonus: The IP-accessible ConferenceSHOT AV incorporates the Vaddio Remote Management system. A built-in Web server enables both browser control and IP-live preview and setup from PCs, Macs and mobile devices including iPhone, iPad and Android devices. With an update that provides compatibility across third-party displays, Prysm Visual Workplace can bring the collaboration to nearly any conference room with an interactive LCD display. To deliver the best results, let that display be a 4K or UHD resolution LCD that offers a DisplayPort 1.2 and USB 2.0 based touch sensor interface. Then prepare to immersed in collaboration, because Prysm also Live Source Streaming, Quick Start and Wireless Screen Sharing to this visual collaboration platform. Run it on your company’s private cloud or Prysm Cloud, which is built on the Microsoft Azure platform. Now WolfVision’s Cynap collaboration system has a Capture Feature Pack option that uses Opencast technologies to provide secure, reliable, scheduling, processing, management, and intelligent distribution of academic and corporate video recordings. In addition to its central video recording options, the vSolution Capture app for iOS and Android also enables multiple users to simultaneously receive and record a wireless stream from Cynap onto their own mobile devices, giving each person their own flexible, personalized lecture capture solution. 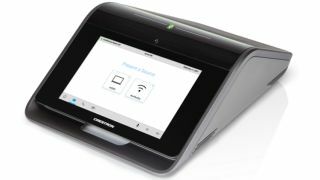 The fully BYOD-compatible Cynap can be used with or without a connected Visualizer system, and it features a built-in media player, WebRTC web conferencing, streaming, BYOD mirroring, plus whiteboard and annotation functionality. A new generation of Oblong’s spatial wand brings a whole new look and feel to the proprietary hand-held device for controlling content from any location in a Mezzanine-enabled room. Upgrades will be easy, as the infrared sensor system for tracking the new wand mounts to display screen perimeters and requires no room remediation or special ceiling configurations. Seeing collaboration moving into more and more spaces, Barco has added an enterprise-ready model to its ClickShare line, providing a centrally managed and secure solution. The ClickShare CSE-800 brings dual-network support and a list of specs to suit the enterprise space, including dual HDMI video output and input up to 4K and the ability for up to four ClickShare users to share simultaneously, with up to 64 users connected. Blackboarding and annotation are provided for interactive teamworking, with support for AirPlay, Google Cast, MirrorOp, iOS, and Android. Walk up to any Cisco Spark Board in the world, and it will recognize you. Then with one click you can share with a global, worldwide network of workspaces, which you can access from anywhere. The cloud-based Spark Board acts as a wireless presentation display, digital whiteboard, and a next-gen videoconferencing system featuring a 4K camera and “theater-quality audio” with VoiceTrack technology. New ultrasound wireless pairing technology enables control from PC, Mac, tablet, or mobile phone. Remote users can annotate shared content via the Cisco Spark app. Connect with any HDMI-compatible device using the ELMO Huddle Space Collaboration Hub in 1:1 and BYOD classroom settings. It’s a simple eight HDMI input connection source equipped with video and audio recording. Switching between iPad, Chromebook, Windows, Mac, Android, or even your favorite ELMO Doc Cam is as simple as pressing a button. Each input has a corresponding button and when a button is pressed, that student's screen is broadcast to the shared display. Go wireless with Huddle Space’s optional battery and a third-party HDMI wireless transmitter. Simplify scheduling, streamline document sharing, and make optimal use of huddle spaces and small meeting rooms with the new AMX Acendo Core from HARMAN Professional Solutions. Acendo Core features direct integration with Microsoft Exchange scheduling, one-touch Skype for Business integration, native document viewers, email document sharing, and more to help teams improve collaboration and maximize productivity by starting meetings quickly and easily. Start a call or a meeting at the press of a button, navigate to a document on a USB drive, network drive, or the Web and begin the presentation. For enterprises who store documents on network drives, Acendo Core integrates natively with Microsoft Active Directory so users can authenticate into a meeting and instantly access stored content. The hardware UI of wePresent’s Wireless Interactive Collaboration System WiCS-2100 was designed to give presenters a smooth and seamless way to confidently share content. It allows previews of connected devices by a moderator before they’re displayed, and features an enhanced onboard moderation utility that will be a boon to those in the education sector. The WiCS-2100 supports most major platforms for computers and mobile devices, including enhanced compatibility with Apple AirPlay and integrated Google Chromecast support. Network-integrated management is enabled with wePresent’s server-based Management Suite, which allows administrators to schedule firmware updates, change the configuration of individual units, or remotely troubleshoot problems with the hardware. Black Box’s Coalesce wireless BYOD collaboration solution enables any number of users to efficiently share and manipulate any type of content from any device over a WiFi or Ethernet network. The turnkey solution connects to displays in conference rooms, meeting rooms, and huddle spaces. It boasts features like live streaming (desktop, docs, images, videos, and apps), display-side interaction with multi-touch support, and unlimited user posts. The device also acts as a wireless access point, which enables visitors to collaborate while keeping the corporate network secure.